This white baby afghan is crocheted with" I Love This Yarn" yarn. It has a beautiful lace and shell pattern. It would make a wonderful addition to any nursery. 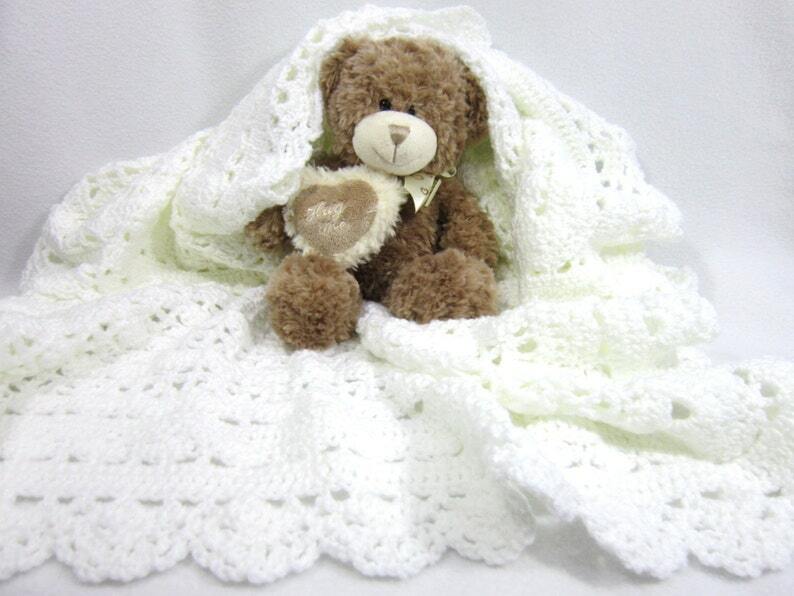 It's the perfect afghan for a christening or dedication. What a keepsake for your little angel! The yarn that is made from is more durable than regular light weight baby yarn, so it will hold up better. It is also thicker, yet has a wonderful soft feel to it. Just perfect for any little baby. Bear not included with purchase. This afghan measures 44 x 33 inches. Machine washable - gentle cycle. Please lay flat to dry, or dry on a low heat. Or this afghan may be hand washed. Please feel free to check out my other afghans here. Incredibly fast shipping. The blanket is beautifully made! Thank you so much.